According to the Occupational Safety and Health Administration (OSHA), cardiac arrest or heart attack causes 15% of workplace fatalities in the US, and 40% of these cases could have been saved with immediate defibrillation. 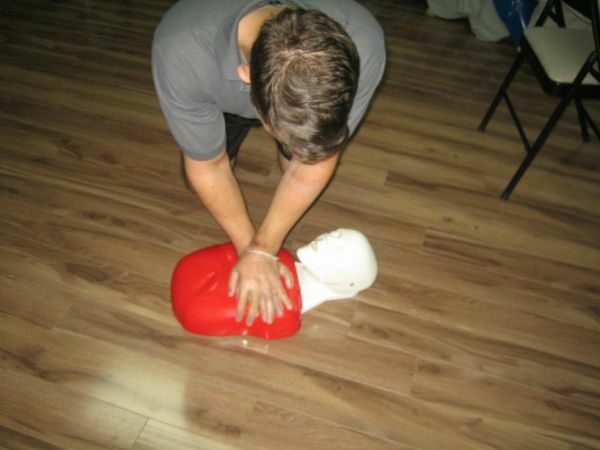 Of the 220,000 victims of cardiac arrest per year, 10,000 occurred at work. Moreover, waiting for the ambulance and emergency response results in only 5-7% survival. On the other hand, immediate defibrillation increases the chances of survival by up to 60%. Since the development of portable defibrillators, fatalities due to cardiac arrest have significantly decreased. AEDs are advanced models of portable defibrillators that are designed to analyze the heart rhythm and deliver electric shock to individuals suffering from ventricular fibrillation to restore normal heart rhythm. Ventricular fibrillation is the abnormal, uncoordinated heart rhythm that most commonly occurs with sudden cardiac arrest. This is the reason why we need to have first aid training experience. Sudden cardiac arrest results from the uncoordinated, ineffective contractions of the heart or when the heart ceases to function altogether. It causes the victim to lose consciousness, collapse, become unresponsive. Without proper medical attention, the victim may die. It can occur to anyone even without prior history of heart disease and often happens without any warning. Some of the common causes of sudden cardiac arrest in the workplace include heart attack, cardiovascular disorder, electrocution, and asphyxiation due to poor ventilation in the work environment. Sudden cardiac arrest can occur while on the job. AEDs in the workplace can cut the time needed to restore the heartbeat, therefore improving the chances of survival. A ventricular fibrillation can lead to cardiac arrest unless an electric shock is delivered. An AED is lightweight, compact, battery operated, portable, easy to use, and safe. The presence of an AED in the workplace actually makes the environment safer. However, the placement of the AED should be carefully studied in order to make the response time within 3-5 minutes. It is recommended that AEDs be conveniently installed in areas where people closely gather, such as office building and assembly lines. There should be an AED near or within confined spaces, in areas where electric-power devices are used, outdoor worksites prone to lightning strikes, and other remote sites, such as marine vessels, construction projects, off-shore drilling rigs, energy pipe lines, and power transmission lines. An AED should also be found in health units where workers may seek emergency care for symptoms of heart attack. Cafeterias and company fitness units should have an AED on standby. Try to watch a webinar about emergency first aid training online.